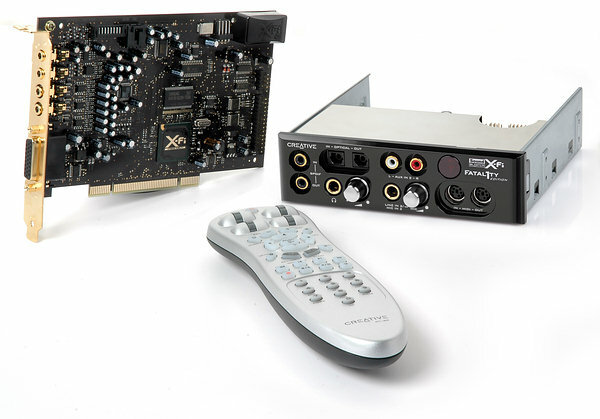 On August 2, 2005 Creative conducted a conference in Germany, where it presented sound cards of the new generation to the European press - SoundBlaster X-Fi. 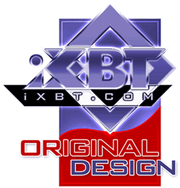 Even before that date, on May 13, 2005 Creative had announced the Xtreme Fidelity technology, or simply X-Fi, and an audio processor of the same name. The new processor is more or less clear, but what's the Xtreme Fidelity technology? According to the manufacturer, it consists in supporting 24-bit quality, stunning audio clarity with a minimum of 110db SNR and the new CMSS® (Creative Multi Speaker Surround) 3D headphone and surround speaker technology. According to Sim Wong Hoo, the founder and CEO of Creative — "Xtreme Fidelity is the result of our vision of a new audio standard which would provide a dramatic improvement in MP3 music, PC game play and digital movies, thereby setting the stage for a whole new platform for digital entertainment in the home». 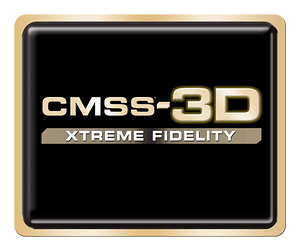 Speaking of Xtreme Fidelity, the manufacturer emphasizes two new technologies: 24-bit Crystalizer and CMSS-3D. 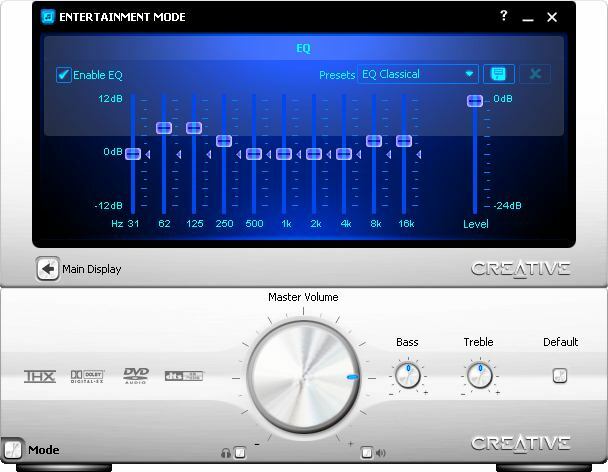 Creative designed these technologies to re-master, enhance, and re-mix the existing compressed 16-bit stereo data in real time into 24-bit quality surround audio with speakers of any configuration as well as in headphones. 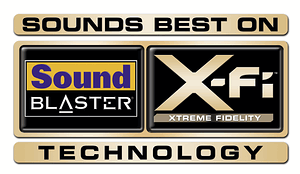 In order to support features of the new standard, Creative created the X-Fi processor with a logotype "Xtreme Audio Needs An Xtreme Fidelity Processor!". The previous sound cards, starting from Live! 1998, have been based on the EMU10K processor modifications. This processor was designed mostly for synthesizers and E-MU production modules as a hardware MIDI-synthesizer with a built-in effect-processor. The EMU10K was a progressive chip for the time, when the main requirement to a sound card was hardware MIDI with a maximum large memory bank, wide range of features and high-quality effects. But it's quite clear that this processor is currently obsolete. Despite the 32-bit audio processing, programmable high-quality professional effects, support for 8 digital I2S or SPDIF interfaces, its disadvantages (its key flaw is stiff architecture) brought everything to nought. Audio interests of users have changed considerably since the appearance of the EMU10K. 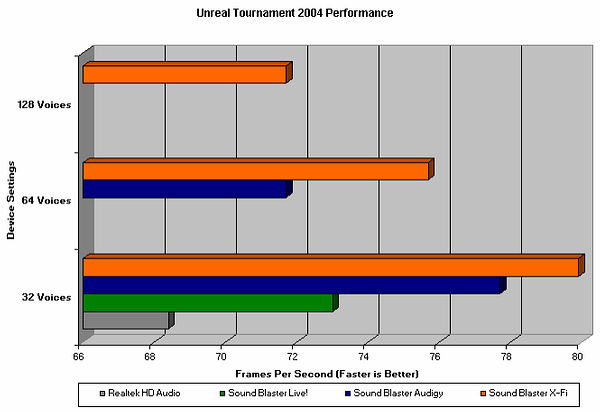 In fact, the audience split into three camps: 1) office and other users, who are content even with the integrated audio; 2) gamers, who are not into audio quality; who like good 3D audio in games, if it's not to the detriment of performance; 3) melomaniacs and audiophiles, who use a computer as a convenient music library, — they need a sound card solely for a high quality playback of music. But audiophiles impeached credibility of Creative products, even though the latest models were equipped with high quality I2S Cirrus Logic DACs. For a long time the main shoo-away, damaging the image of Live/Audigy cards, has been the uninterruptible mediocre hardware resampling of all frequencies into the reference frequency of 48 kHz. In order to get high quality playback of 44.1 kHz format (the majority of records), users started installing DirectSound or ASIO SSRC plugins (software sample rate conversion) for popular mp3 players - Winamp and Foobar. Starting from Audigy2, designers introduced the P16V unit into their processor, which allowed cards to play back DVD-Audio (96 and 192 kHz). But this mode was available only for those frequencies and only via DirectSound interface. 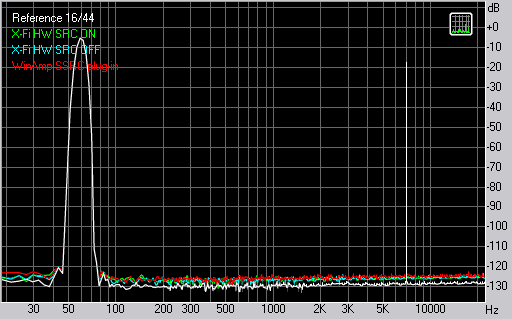 The effect-processor operating at 48 kHz must be disabled in this case. Otherwise, resampling will intervene again. In the low-end sector Creative starts disastrously losing the market of sound cards to the expansion of AC'97 and HDA codecs preinstalled on motherboards. Users lose their incentive to pay for an external sound card. Besides, the advance of Internet and file sharing networks turns a computer into a storage of files in compressed formats. That's why many users prefer semiprofessional cards on Envy24 for high quality music playback - minimum hardware features, with fixed sampling frequency selection, sterling 44.1 kHz and minimum unnecessary bells and whistles. Creative was obviously in need of a new processor, devoid of previous drawbacks. X-Fi has been in development for the last five years. The company started designing a processor of the new generation since the launch of the first Audigy model. Location: Creative Advanced Technology Center, Silicon valley, California. 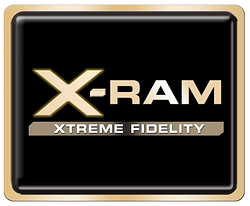 According to the manufacturer, the new Xtreme Fidelity audio processor packs in over 51 million transistors that churn out over 10,000 MIPS of power! (millions instructions per second). X-Fi is 24 times more powerful than its predecessor. The heart of the processor is DSP "Quartet", as there are 4 sub-processors operating independently. The architecture is called TIMD (Thread Interleaved Multiple Data). In order to gain parallelism , the audio processor is based on the architecture with Very Large Instruction Words (VLIW). Each sub-processor has the 2xSIMD architecture. 2x means that a sub-processor usually operates with two data streams - stereo data, complex numbers. By the way, floating point as well as fixed point formats are used. A set of instructions consists of 235 operation codes and about 60 special instructions, which can often be found in frequency processing algorithms, for example complex multiplication of data from two streams, decimal logarithm, exponent. Internal clocking of the processor is 400 MHz. It supports External Clock masters for S/PDIF and I2S. PPL performance - <60pSecs jitter. For reference, the 10Kx processors have jitter in the neighborhood of 110pSecs. Audio processing algorithms (reverberation, equalizer, 3D spatialization) use 512 floating point IIR (infinite impulse response) of the second order. There is nothing surprising here for a modern audio processing tool. But we should take into account that everything works in real time here, for dozens of streams simultaneously. Hardware filters also include 4- and 5-parameter parametric EQs, band-pass, band-reject, and other specific filters. There are also rich mixing features - up to 4096 signals with HW support for scaling and aggregating two separate sources. It can be used to build a flexible mixer in terms of signal routing as well as for games, as it requires parameter mixing for each effect. 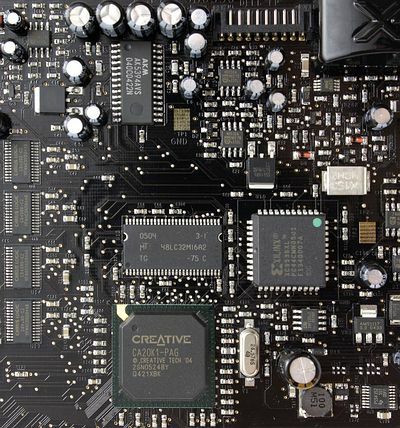 The processor has 4 input/output I2S buses to connect to digital and analog interfaces, which provide 8 input and 8 output channels. Besides, it has a proprietary protocol for transferring 8 channels along a single wire, so that we get 32 Ñ… 48 kHz, 16 Ñ… 96 kHz, 8 Ñ… 192 kHz channels. There are 4096 audio and 4096 parameter channels for internal use and routing. Sample Rate Convertors (SRC) are used when a sample frequency does not match the reference frequency of the current mode (otherwise, the sample will be played with the wrong speed and will change its tone). There are 256 interpolators of a higher quality than in case of a typical poly-phase FIR (finite impulse response) implementation with order 100. Supported pitch range is from 0 to 8. 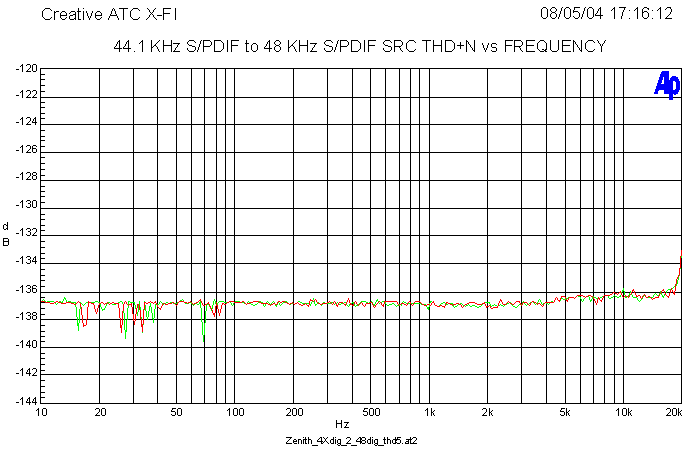 This picture illustrates SRC X-Fi converting 44.1 kHz into 48 kHz. At first, signal samples are doubled to 88.2 kHz. The Poly-Phase FIR converts the signal to 192 kHz with a coefficient equal to the doubled 48/44.1 ratio. In the final stage, the frequency is reduced to 48 kHz. This scheme is more efficient in terms of calculating resources and yields higher quality, as there is no aliasing at the final stage due to aliquant frequencies. When a 997Hz tone is converted from 44.1 KHz to 48 KHz, THD+N equals -136 dB, +/- 0.00025dB pass-band ripple. Creative recommends at least AudioPrecision (AP) device to measure these parameters. Considering the headroom of 6 dB and 32 processing stages, THD+N may deteriorate to –124 dB, and the pass-band ripple may grow to ±0.01 dB. But even the best DACs are worse as far as these noise and distortion parameters are concerned. We should only take into account that the quality parameters in the frequency range do not characterize filters in the time domain. But considering that these cards are intended mostly for games and movies, this conversion precision may be considered excellent. Intermodulation distortions from SRC in previous models reached 0.1% in the HF band, but only few users complained about the quality drop. There is one very important issue, which is not exactly advertised by the manufacturer - unlike the audio processors of the previous generation, X-Fi allows to disable resampling as well as other DSP effects! In this case you lose the unique feature to listen to several parallel signals with different sampling rates and apply various effects and improvements. But if you love maximum audio quality, you need this feature the least of all. SRC converters also support DMA mode to process audio right in the main memory, without CPU. The tunable cache enables the system to compensate for PCI bandwidth issues. 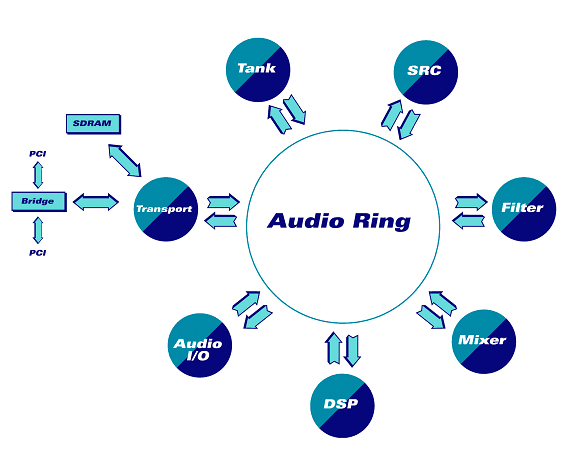 HRTFs / Headphone processing is based on several technologies. These are UCDavis, Aureal, and Sensaura. It uses patents on MacroFX, binaural 3D panning. It includes 48-tap FIR filters, to process up to 128 3D sources. 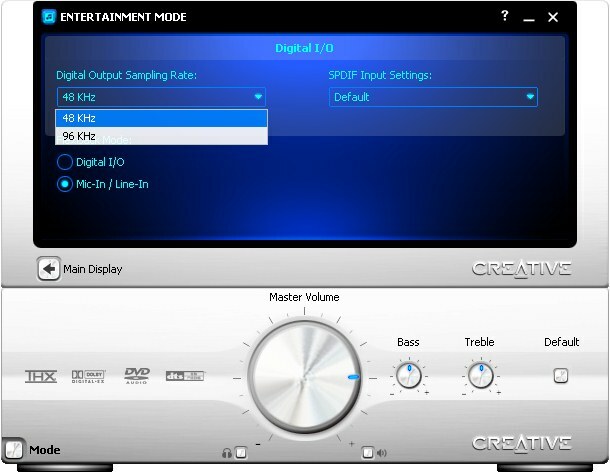 CMSS (Creative Multi Speaker Surround) technology is updated to CMSS-3D. According to the manufacturer, this approach yields better results, especially with respect to sound field stability, than Dolby Prologic II/IIx. It also achieves more natural HF timbre and spatiousness than Dolby Headphone. Unlike the previous generations of audio processors, the new processor also supports effects for 24/96 and 24/192 modes. Quadrature Mirror Filter is used for processing very high sample-rate recordings, for example 192 kHz - splitting high-frequency recordings into up to 4 x 48kHz bands. Effects can then be applied to these separate bands and then the bands rejoined. 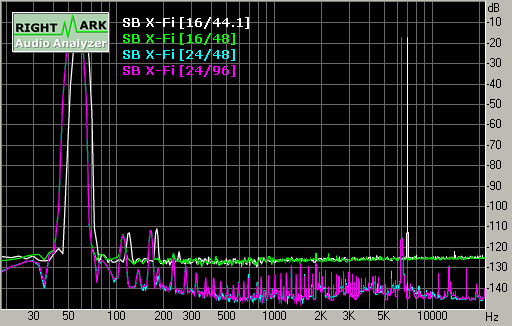 Thus, 192 kHz signals are processed faster relative to regular methods. The chip architecture allows switching between modes without rebooting, so sound cards can make maximal use of resources. ASIO 2.0 is supported with < 2mSec latency. 0% CPU overhead is required to pass audio to/from the host to hardware. 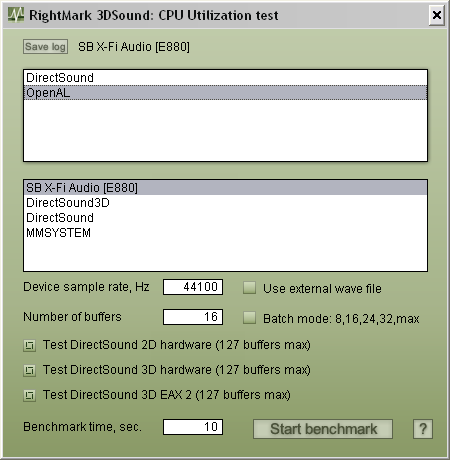 WDM and OpenAL driver and hardware support is optimized to obtain the lowest latency and highest quality interactive audio. The table contains rough estimates of performance offered by various sound cards from Creative (according to the manufacturer). The X-Fi is designed with a completely new architecture, unlike any other audio processor that has ever been designed by Creative, as well as unlike all the other processors, including GPUs. The concept is a programmable ring architecture. This architecture is very flexible in signal routing, with 4096 audio ring channels that route audio to any of the processing elements - Tank, SRC, Mixer, DSP. Hardware Accelerated Mixer, Tank Engine (effects), Filter Engine, DMA. Wealth of information on the X-Fi audio processor can be found on this web site: www.soundblaster.com/products/x-fi/technology. 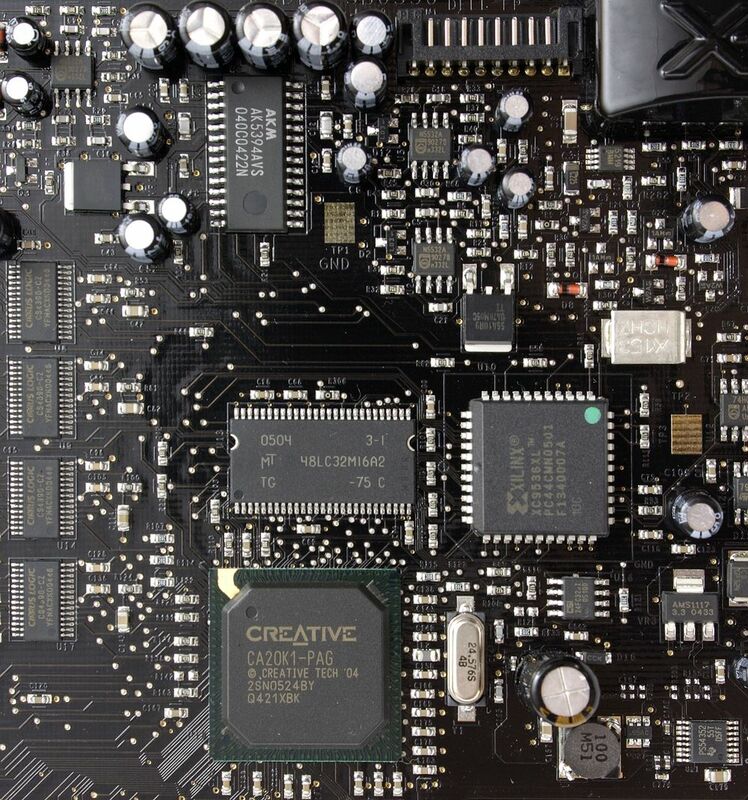 On August 8, 2005 Creative announced a new series of Sound Blaster X-Fi cards based on the cognominal processor. There will be four models: Sound Blaster X-Fi Elite Pro, Sound Blaster X-Fi Fatal1ty FPS, Sound Blaster X-Fi Platinum, Sound Blaster X-Fi XtremeMusic. 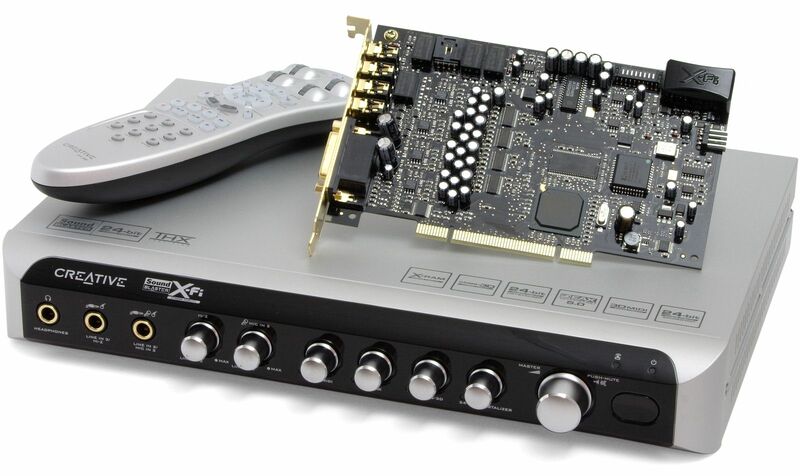 Sound Blaster X-Fi Elite Pro is equipped with a professional-quality DAC of 116 dB SNR, plus an external interface module with 24-bit Crystalizer, X-Fi CMSS-3D, 3DMIDI and EAX controls. The card has 64 MB of on-board X-RAM as well as mike and guitar preamplifiers. The approximate price is US$399.99. Sound Blaster X-Fi Fatal1ty FPS was designed to meet the requirements of Johnathan "Fatal1ty" Wendel, the famous gamer. The card offers 109 dB SNR, 64 MB of on-board X-RAM. The bundle includes an internal rack for 5" bay and an IR remote control. PCI card with lower quality DACs. Price: US$279.99. By the way, you can order an IR USB receiver and a remote control even for this card. In this article we are going to review the most interesting model - Sound Blaster X-Fi Elite Pro. The distinguishing feature of this card is the highest quality and performance, plus an enormous external rack with a remote control. The card itself, marked SB0550, has gold plated connectors and a mysterious rectangular element in the upper corner of the PCB. In actual fact, it turned out a light emitting diode with the X-Fi inscription, which lights blue when a computer start up and will be easily visible in semitransparent modded PC cases. 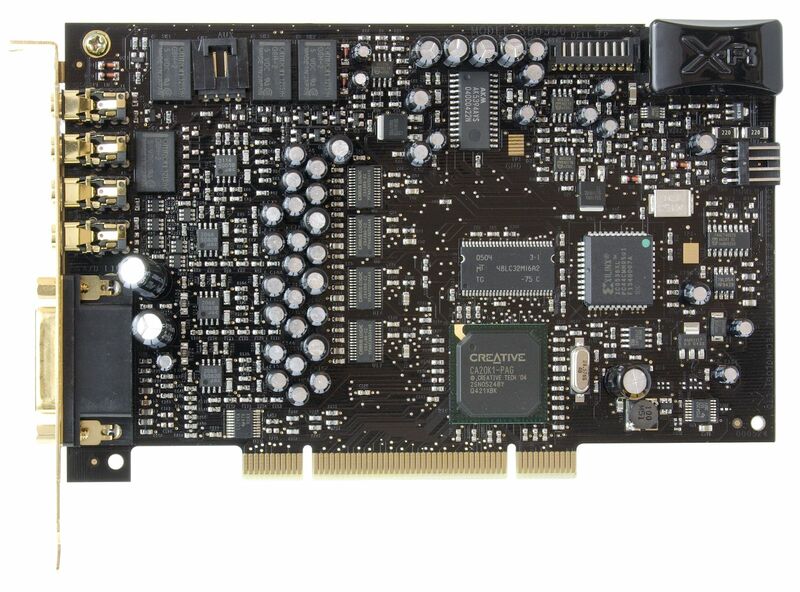 The card is equipped with Cirrus Logic CS4398 DAC, advanced multi-bit Delta-Sigma architecture, 120 dB DR and -107 dB THD+N. The same DAC is used in E-MU 1212M/1820M, Creative Audigy4 cards. Its ADC is the well known top AKM converter, advanced multi-bit architecture, 123 dB DR, THD+N -110 dB. Many readers are scared by unknown words in the "converter architecture" line. There is an opinion that all high-quality converters (= "parallel", "multibit") are things of the past. Unfortunately, this opinion is supported by many competent and respected experts. When appeared the first inexpensive converters with oversampling as well as 1-bit delta-sigma modulators, the quality of converters indeed left much to be desired, they were good only for low-end devices. That was their initial destination. However, drawbacks of these solutions were thoroughly analyzed later on. New research was conducted, technologies evolved, new designs were applied. These days modern delta-sigma multibit DACs have little to do with 1-bit delta-sigma modulators 15 years ago. Moreover, all DACs have different circuitry and implementation (quality of the elements). That's what governs the price and quality of a DAC. The task of a DAC is to recreate an analog signal as precise as possible using samples. It's impossible to realize a mathematical abstraction in the real world, so this problem transforms into the price/quality ratio of a given technical solution. Multi-channel parallel 24-bit DACs in serial production are possible only at high costs and a very low yield of effective products (resistors are burned by a laser), plus technical problems with a filter implementation. 1-bit modulators offer unsurpassed linearity, but have problems with filtering shaping noises. Modern multibit delta-sigma DACs take the best from both technologies and solve these problems in the most efficient way. Let's refer to "A Multibit Delta–Sigma Audio DAC with 120-dB Dynamic Range" Ichiro Fujimori, Member, IEEE, Akihiko Nogi, Member, IEEE, Tetsuro Sugimoto. Here is an architecture of a typical MULTIBIT DS DAC: 24-bit digital signal is 128x oversampled and then is applied to the digital DS modulator (DSM) operating at 6.144 MHz. In comparison with a 1-bit model, 5-bit DSM of the 3rd order generates insignificant quantization noise in the total noise level. The 5-bit DSM output is converted into a 31-level code and then into DEM, where the problem of nonlinear quantization and temperature dependence is solved. DEM data goes to the analog reconstruction unit, including the DAC on switched capacitors (SC) and the post filter on IIR and FIR filters, increasing the jitter resiliency. Even the high-quality BurrBrown PCM1704 DAC for audiophiles, which is often considered a pure multibit converter, in actual fact operates by the sign-magnitude technology with 8X oversampling for a digital filtering option with an active low-pass 2nd order filter at the output. 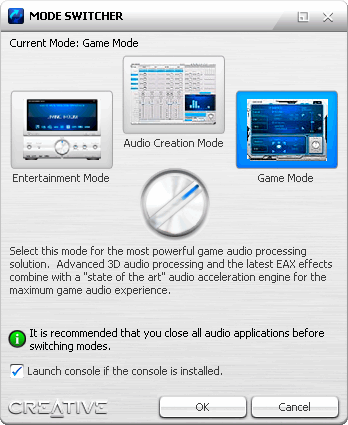 X-Fi cards have three operating modes: Entertainment, Games, and Audio Creation. You can choose your mode in a Mode Switcher. Besides different designs, these modes differ by optimizations to certain tasks. It has to do with resource management optimizations. For example, in Game Mode the effect-processor and hardware buffers are used for EAX5, while in Creation Mode they are released to support the hardware MIDI synthesizer. When in Entertainment Mode, the control panel imitates a digital processor or a receiver from the world of consumer electronics. You can display settings for various modes. S/PDIF settings lack 44.1 kHz - it's an unfortunate error that suggests nasty ideas. Perhaps the drivers will be improved in future and this setting will be added. Game Mode offers a different design. But the options are practically the same. RM3DS diagnostics show another important difference of the Game Mode. That's where the support for EAX5 and 128 sound buffers appears. We have diagnosed X-Fi features in our RightMark 3DSound 2.0. The card operated in Game Mode. We found out that support for EAX4, EAX5, as well as for 128 hardware buffers (1 primary, 127 secondary) appeared in this very mode. 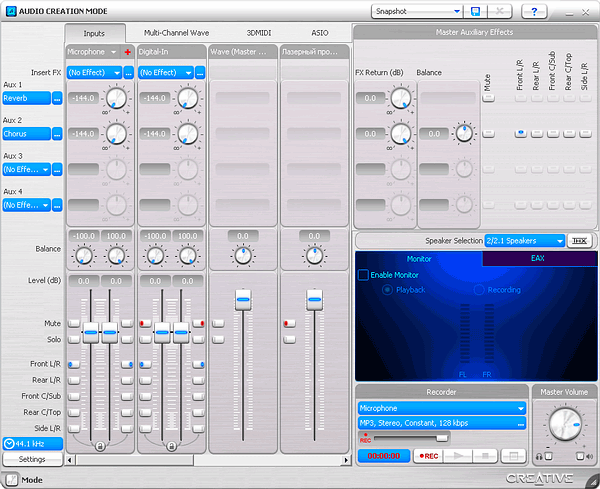 In Audio Creation Mode, it looks like a Mixer with tabs. The most interesting feature here is the selection of a Master Sample Rate. See - the 44.1 kHz option is available! Long-awaited "Enable Bit-Matched Playback" is also available. It disables SRC and activates Auto Master Sample Rate - it's automatically set to the frequency of the currently played file (like in Envy24 sound cards). Interestingly, 192 kHz in the Master Clock list is not available. You can also select the FlexiJack mode, which combines a line-in, mic-in, and digital interfaces in case you have an optional adapter. 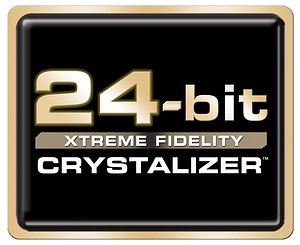 After justified reproaches to the advertisement campaign for 24-bit cards of the previous generation, about 24 bits being excessive for playing back 16-bit CD and MP3 (99.9% among digital recordings of a modern melomaniac), Creative marketing specialists quickly invented a technology that uses 24 bit in real life. Meet 24-bit Crystalizer! Before the field tests of this technology, I have read and heard a record-breaking number of pseudo-scientific nonsense and blunt fairytales. The funniest phrase belongs to the Creative website, it claimed that this technology enhances MP3 by making your music sound even better than it did on the original CD, before it was compressed to MP3 . This phrase is indeed an invention of marketing guys, who have their own alternative idea of quality. This technology is dished up under the sauce of expanding the dynamic range of 16-bit records to 24 bit due to some smart record analysis and bringing them back to details, lost at the conversion processes, and making up for the compromises, appearing at the mastering stage. In practice, it took me less than a minute to figure out what Crystalizer really was. This technology is similar to what we have seen in Intel with its HDA, in the bundled Intel Audio Studio. Indeed, a record is remastered by a well-known mastering plug-in called "multiband compressor". Just to make sure I was 100% correct, I compared Crystalizer with three mastering multiband compressors: Waves LinMB, iZotope Ozone, Steinberg MultiBand Compressor. These plugins changed the audio character similar to Crystalizer. To be 200% sure, I tested Crystalizer in our RMAA and compared it with the results of Waves LinMB Linear Phase MultiBand compressor (with the standard Low-Level Enhancer preset - if you'd like to carry out this test on your own). Crystalizer was configured by default in the medium position. Pay attention to the frequency response equalization and large intermodulation distortions - the plugins' effect is similar. But the results sound much better. It has to do with the music signal differing from the test sample. According to psychoacoustics, people don't notice overloads shorter than 6 ms. A high quality compressor does not tolerate long overloads, it quickly reduces the signal level, regulated by the attack time. We can also find a counterpart of the Crystalizer technology in the world of digital photography. Suppose there appears a new plug-in that converts a JPEG file, compressed from a high-quality TIF, into 16-bit color; then it adjusts tonal range (roughly speaking, it increases brightness/contrast) and sharpness by 10-20% depending on the original image. Here we go! We get a new brilliant "48-bit Picturelizer", which enhances JPEG and makes them better than the original TIF. Here is the question: in what case the quality is higher? You are right, only when this JPEG file has a quality margin for such violations and a display has problems rendering the lightest and the darkest halftones of the original image. The situation with MP3 and WAV is similar, but there is some difference. Mastering studios use very expensive equipment that analyzes the original file: not in the real time, but running a tad forward, or even at several passes; and the calculation precision is floating point 64 bit instead of 24 bit. Then, mastering compression parameters must be laboriously adjusted individually for each record on high-quality reference monitors of the middle and far field. To delegate a similar function to real time automation and then speak of the advantage over the studio results is arrogant at best. The final mastering stage includes a noise shaping step, which makes a 16-bit record sound like a 20-bit one. So the only thing left is to transfer the record bit-by-bit to the DAC input. Any interference into this process damages audio quality. Anyway, an MP3 file cannot possibly be better than the original record, multiband compression may distort the tone balance and result in the redistribution of signal energetics, which will lead to the overload at high or low frequencies. It's quite another matter, if we speak of mediocre consumer acoustics with a limited dynamic range and defective frequency response, so that even the most primitive timbre adjuster makes a record subjectively much more comfortable to listen to. In this case, an additional band compression of high and low frequencies facilitates the record perception through given speakers, especially combined with moderately compressed original record, with less aggressiveness (peak power/average value). In this case the resulting audio processing distortions will not exceed the distortions in the playback channel. That was the situation in practice. Some records sounded more coherent on inexpensive active speakers, though with more aggression. In case of high quality acoustics (studio monitors and Hi-Fi speakers of the mid class), I had no problems picking several MP3 files as well as original CDs, which quality was degraded by Crystalizer. I heard overloads, or the sound got too aggressive, so that I was getting tired of listening very fast. 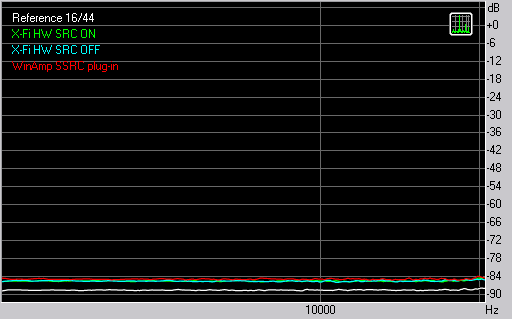 Our measurements showed that besides the multiband compression, the signal level is raised approximately by 3 dB. So that any quiet records would seem subjectively better even without the compressor. 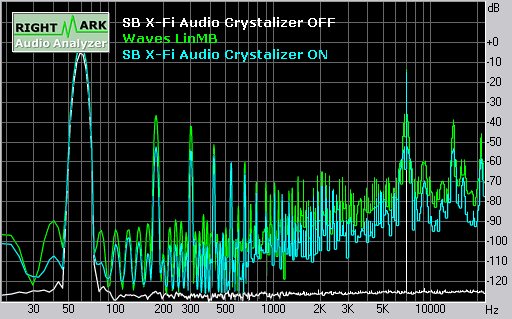 Thus, 24-bit Crystalizer will come in handy to owners of inexpensive acoustics or low end headphones, which automatically means insufficient LF and HF, as well as problems with medium frequency detailing. The good news for owners of high quality acoustics is that this technology can be easily disabled. 24-bit Crystalizer technology has a right to life, but the way this technology is announced with a portion of wishful thinking is disappointing. 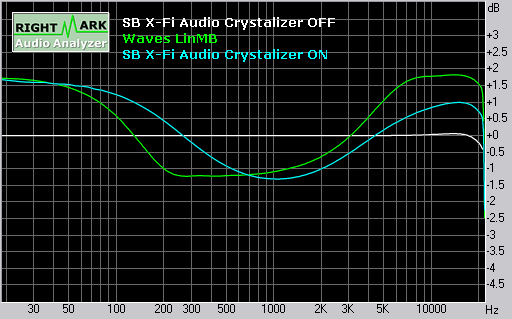 In reality, Crystalizer does not expand, but narrows down the dynamic range. It really uses 24 bits, but this is done only to avoid the rounding error accumulation (it's normal practice, no modern DSP works in the same resolution as the original data). CMSS-3D technology is intended to solve the main problem of the young generation of multi-channel sound card users: "I have 5.1 speakers. Movies sound great, but only two front speakers work when playing MP3! I want'em all!!!" 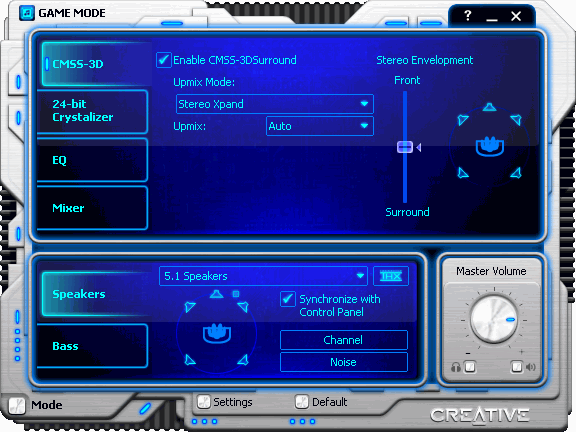 As it has been mentioned above, CMSS technology (Creative Multi Speaker Surround) was updated to CMSS-3D. It uses patents and designs from IRCAM, UC Davis, Aureal, Sensaura, and Creative's Advanced Technology Center. 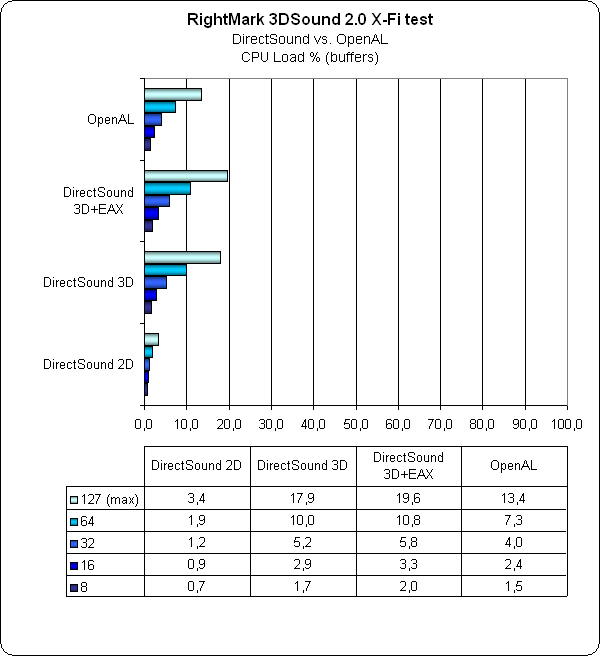 CMSS-3DInteractive: 3D sound from several sources. Tests were carried out in Sennheiser HD600 headphones. We detected the problem of duplicated virtualization effects with the surround effect deterioration. The fact is that all music records of the last years already contain stereo panorama expansions to this or that extent, so the results may be unexpected. At the same time, "The Rising of the Sun" demo file from the "Essential Anuna" CD (practically raw stereo) demonstrated good results and even advantage over DolbyHeadphones technology. 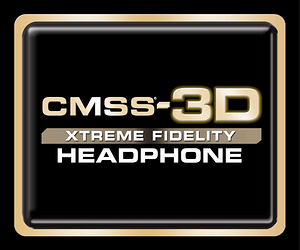 Besides music, the CMSS-3D technology may be used in games. In this case a game upmixes 3D sound to 5.1 speakers and CMSS-3DHeadphone converts multi-channel audio into surround sound in headphones. Unlike sound cards of the last decades, X-Fi on-board memory is used for storing and caching sounds in games instead of MIDI samples. There exists a problem of memory deficit, so developers either reduce the sample depth to 8 bit 11 kHz, which drastically damages quality, or they compress samples into lossy formats (MP3 or OGG), which loads a processor when samples are decoded for playback. Thus, on-board memory on a sound card provides the following opportunities: to save the main memory, to accelerate access to memory, to avoid real time decompression, to avoid sample quality deterioration, to increase graphics performance and FPS. There is currently only one game with sterling X-RAM support. It's UT2004 X-Fi Edition, which is not yet available to mass users. We suggest you should look through the results published by Creative. 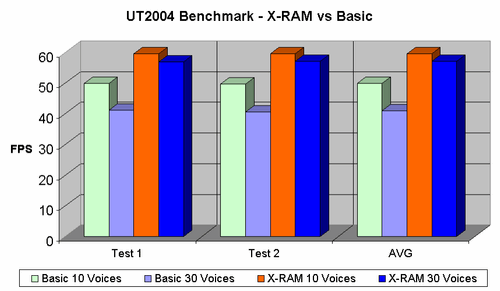 As you can see, X-RAM introduction may increase performance up to 20%, which is equivalent to upgrading a graphics accelerator. Moreover, your audio quality will grow as well! That's a definitely useful innovation. We cannot help referring to the Creative Review Guide for X-Fi. "As we have already discussed Creative have designed the Sound Blaster X-Fi range first and foremost with audio quality in mind. To achieve this we have taken quality testing very seriously. We recognize however that not all journalists have access to “Audio Precision”, an industry standard professional audio test bed. We have seen many journalists use “RightMark Audio Analyzer” for audio quality tests due to its easy availability and slick interface. However due to the different test methodology between these two test platforms the results from them will vary. In the past we have had some queries regarding this difference and so we wanted to show our achieved results and test methodology for both Audio Precision and RMAA. We hope you find this useful to you." You can download Creative's instructions on how to install X-Fi cards to test them in RMAA on the official website audio.rightmark.org. N.B. “Digital Playback” refers to the fact that only the quality of the line-out is tested using a digital source file. It is not a test of the digital outputs. “Digital Playback” refers to the fact that only the quality of the line-out is tested using a digital source file. It is not a test of the digital outputs. Comparing RMAA loopback vs. AP loopback test results, I'd like to note that the difference amounts to single percents, which is the effect of different calculation algorithms. The latest Version 5.5 keeps to the maximum correspondence to the existing international standards (but RMAA uses more accurate calculations, than the standard requires). 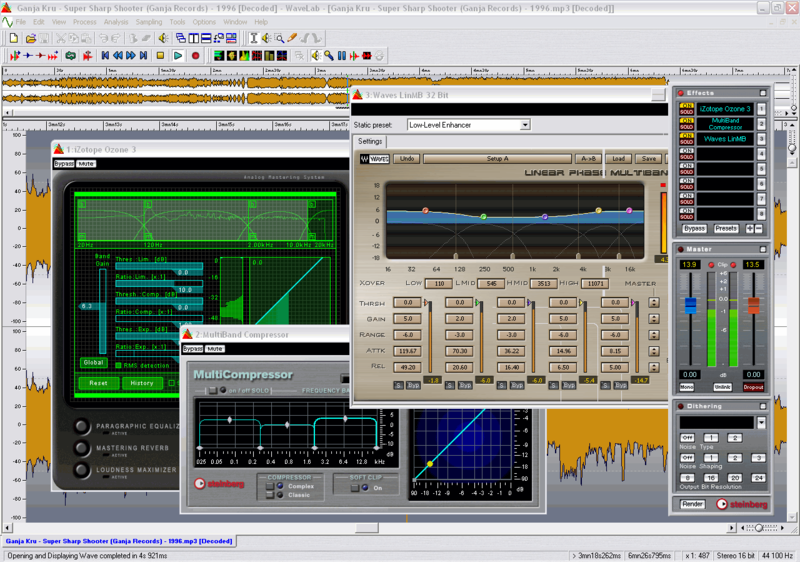 Considering the kilobuck price of Audio Precision and the freeware nature of RMAA, we can safely recommend this program to test specifications. THD+N must be taken from the detailed RMAA report. Only distortion graphs are of interest here. Judging from our measurements, the problem with a lot of distortions is a thing of the past now. 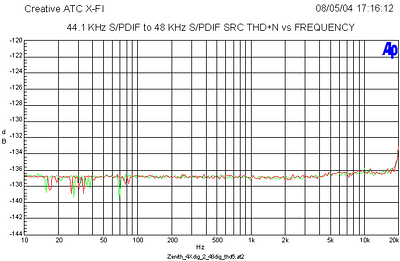 The 44.1 kHz mode in X-Fi cards is no different from 48 kHz. It's interesting to compare the quality of the new hardware SRC X-Fi versus the wide-spread real-time SSRC WinAmp plug-in, notable for its relatively high quality and decent CPU load. Reference 16/44 - analysis of the generated file with original data; it shows the maximum quality attainable for the 16-bit format. 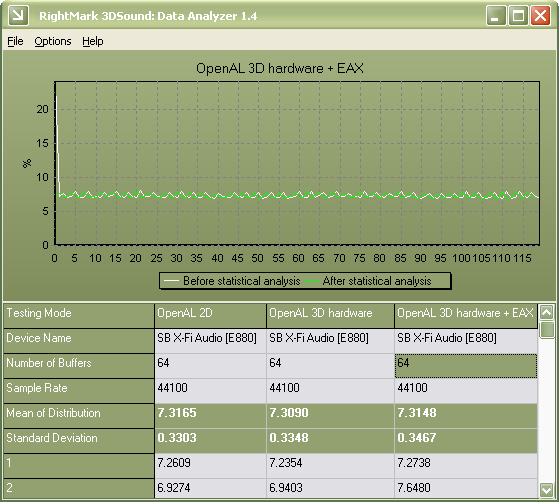 X-Fi HW SRC OFF - hardware SRC is disabled in X-Fi by setting the reference 44.1 kHz mode and Enable Bit-Matched Playback. X-Fi HW SRC ON - hardware SRC is enabled in X-Fi by playing back a 44.1 kHz file with the reference 48 kHz mode and disabled Enable Bit-Matched Playback option. 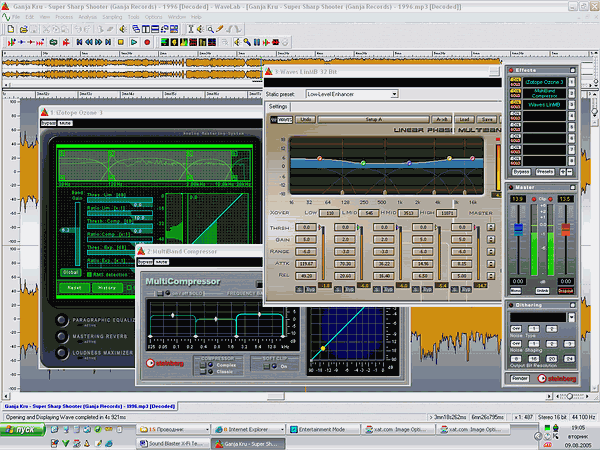 WinAmp SSRC plug-in - playing back a 44.1 kHz file in WinAmp with the installed SSRC plug-in, configured to 48 kHz resampling; the reference mode of the card is 48 kHz, Enable Bit-Matched Playback. As we can see, SRC cards outperform the SSRC plug-in, it causes no visible distortions on the diagram. The diagram is intentionally plotted at the 100% scale to illustrate that even the manifold difference is insignificant with a small number of buffers, EAX in 3D mode comes almost at no cost. 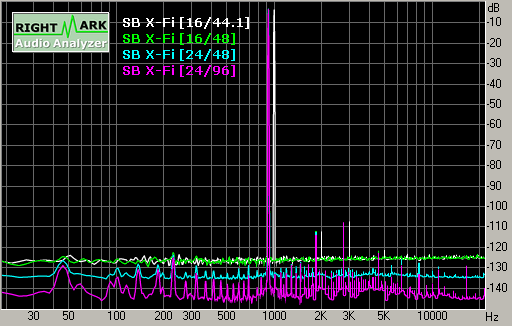 So, the difference between HDAudio and X-Fi in UT2004 with 32 voices reaches 17%, but the new card offers better quality (CMSS-3D and 24-bit Crystalizer are enabled). The computer configuration is moderate: P4-3.4, 1 GB, GeForce 6600. Presently only Battlefield2 offers the direct support of X-Fi (even the demo version! ), implemented via OpenAL. In case of such a card, you may choose Creative X-Fi, EAX and Ultra High audio settings. The on-board memory will be used to cache samples and accelerate audio calculations. It should be added that samples in this game are generally of an average quality, many of them are 22 kHz; besides, they are compressed into OGG with the variable bit rate of 100 Kbit/s. So the audio quality in case of X-Fi and activated EAX deserves a Very Good mark, but no Excellent - that's because the sample quality is horrible. Doom3 with Patch 1.3 (enables EAX4) sounds much more interesting. We carried out our measurements in Battlefield2 using a hacking mod. Our testbed configuration: P4 3.4 GHz, 1 GB DDR400, ATI X800, 800x600, Medium Graphics quality. Creative X-Fi + EAX ON + Ultra High Mode yielded 52 FPS, compared to Hardware + EAX OFF + Medium Mode with its 55 FPS. Thus, the performance difference between maximum and Medium Settings does not exceed 5% thanks to the fast and powerful audio processor. Mind it: video is configured so that performance is not limited by a video card. 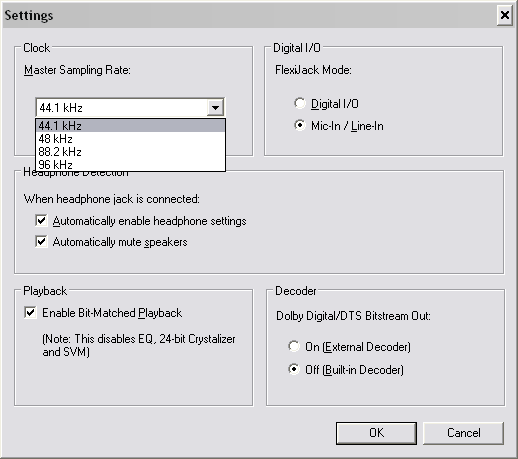 In gaming resolutions you can safely set the audio quality to maximum.